Why are Billionaires Preparing for a Major U.S. Crisis? On the surface, everything in America seems OK. But if that’s the case, why are so many wealthy and well-connected people quietly preparing for a collapse of the federal government… and complete social disorder? Steve Huffman is the founder and CEO of Reddit… an internet firm worth at least $500 million. Another hedge fund manager, billionaire Kyle Bass, built a 41,000-square foot ranch stocked with firearms and gold. passport and a 400-acre estate in New Zealand. A.G. Martínez, a former Facebook product manager, bought an island in the Pacific Northwest and stocked it with generators, solar panels, and ammunition. Why are all these people so concerned? I’m the Founder and CEO of Stansberry Research. Most investors probably know we’re widely recognized as the world’s largest independent financial research firm. We serve many of the world’s top investors: hedge funds, major banks, America’s top money managers, mutual funds, private equity firms, and some of America’s wealthiest families and celebrities. All told, we have more than 350 employees in offices stretching from Singapore to New York City, covering virtually every major financial market in the world, from municipal bonds to exotic commodity-based derivatives. In more than 120 countries we serve nearly a million subscribers, who rely on us every day to help guide their investment decisions and identify emerging risks. And there’s something else. Something I very rarely talk about. More than a decade ago, as America approached its largest financial crisis in almost 100 years, I was one of the very few analysts who foresaw that both Fannie Mae and Freddie Mac would collapse. Barron’s, America’s leading weekly financial magazine, even profiled my work. Likewise, as early as 2006 I explained how GM couldn’t possibly escape bankruptcy. Our firm warned subscribers to short Lehman Brothers and explained why its collapse could trigger a global financial crisis. I believed there was a significant likelihood that the 2008 financial crisis would cause the complete collapse of the existing financial order -- a global flight out of all paper money. I knew the only way to deal with the enormous losses in the U.S. mortgage market (around $2.5 trillion) would be to print money on a massive scale. And that’s exactly what has happened… and why I’m writing to you today. The world’s major central banks have embarked on an unprecedented monetary experiment, printing more than $15 trillion and backing their currencies with risky mortgages, corporate debt, and even highly volatile American tech stocks. But not one American in 1,000 knows anything about these enormous risks that are now hiding in plain sight. Not one in 1,000 understands the direct link between the central banks actions and the incredible bull market of the last eight years. We helped readers see nearly 400% gains by showing them how the government would bail out the banks. We recommended purchasing “warrants” on some of the banks that were bailed out after the last crisis. We showed folks how “easy money” policies would cause gold prices to soar, which lead to gains of as much as 995%. We explained how buying America’s most “capital efficient” businesses, right in the middle of the last crisis, could lead to gains of more than 200%. And we even showed subscribers how to “hedge” their portfolio, by “shorting” a company that issues extremely risky auto loans. The play returned more than 50%. But I’m not writing you today to tell you how to profit from this huge, ongoing financial inflation. I’m writing today to tell you how to survive what will happen next. America is in for some major changes to our economy, our country, and our very way of life over the next five years. And when the next crisis arrives, it’s going to look NOTHING like the last one. The next crisis is approaching… and it’s going to be a shocking event that not only affects the banks and the stock market—but every human on the planet. I’ll show you exactly why this is true, in just a second. We are going to witness major changes to the very fabric of our society. You probably think that sounds crazy. People thought I was crazy a few years back when I predicted oil prices would go from over $100 a barrel to less than $40. Then it happened. People thought I was crazy when I predicted the collapse of Fannie Mae, Freddie Mac, and General Motors. Then they all went bankrupt. People thought I was crazy when I said the biggest mall owner in America and one of America’s biggest newspaper companies would go bust. Then those companies fell apart, just as I predicted. So look… I get it. I’m used to people doubting my analysis. Everything seems better in America. Real estate sales have hit a 10-year high… and the NASDAQ stock market index just hit a new all-time high. Yes, the destruction of our money has been happening for decades. But this problem has accelerated in a dramatic way in the past decade. We’ve DOUBLED our national debt to a whopping $20 trillion! We’ve printed more money out of thin air (nearly $5 trillion) than at any time in our nation’s history. And we’ve artificially manipulated interest rates for the past 8 years, making it easier and cheaper than ever to borrow money. The worst part is that artificially lowering interest rates (as the Fed has been doing for the past few years) has encouraged millions and millions of people to borrow money they can’t possibly afford to pay back. The government’s actions to "stimulate the economy" haven’t led to any real increase to wages or wealth. But it has created a new, enormous, credit bubble. Not including mortgages, the U.S. consumer is now in more debt than ever before in our nation’s entire economic history. At the same time, wages have gone nowhere. This is an economic recipe for a huge wave of debt defaults, with total losses that will rival the mortgage crisis. Not many people understand the fallacy of what our leaders have done to our money. By manipulating its value and controlling its price (interest rates) they’ve simply engineered another huge credit bubble. disaster our country has ever seen. But as I said, not one in 1,000 citizens understands what’s going on or what to do about it. And that’s precisely why I wrote a new book, called America 2020—The New Crisis. This is a handbook, a blueprint, and an owner's manual for how to protect yourself and your family over the next few years. And I want to send you a copy of my new book, at a ridiculously low price. You’ll pay just $19… and I’ll even cover the costs of shipping this hardback volume to your front door. Very few Americans understand the relationship between interest rates, bond prices, and our currency… and how this affects EVERYTHING in the financial world and the economy. So far in 2017, for example, the dollar has fallen dramatically against nearly every major world currency… and has fallen even more against gold and silver. Default rates are rising… asset prices (like stocks and houses) are soaring. But what’s going to happen next? And how can you protect yourself? Everything is explained in our recent book: America 2020—The New Crisis. If you truly want to understand what is going on, how it’s going to affect you and your money, and what you can do about it, there’s nothing else like this available, at any price. The only way you can get a copy is directly through my research firm. And you’ll pay just $19 (which includes free shipping). The truth is, I will actually lose money on each copy I send out. So why would I do this? The American people deserve to know what our government has done to our money, what's coming next, and what you must do to protect yourself and your family from the currency disaster our government has created. I know that the more people who are prepared… the fewer who are relying on the government… the better off we’ll all be. The second reason I'm giving this information away at a ridiculously low price is because I know my Baltimore-based research firm (which I started 18 years ago) does the best work in America when it comes to retirement, investing, and protecting assets for individuals and families. If I can help you prepare yourself for the huge change that’s coming in America, you might become a fan of our work, and a customer over the long term. And I believe that rather than TELLING you about our work... the best thing I can do is simply SHOW you what we do, with a great sample—and no obligation for you to ever purchase anything from us ever again. And that’s why I'm happy to send you my recently published book, America 2020—The New Crisis for just $19. It’s jam-packed with literally dozens of useful ideas that will help protect you and your family. In fact, an index tracking this asset has absolutely crushed the stock market. Since 1992, it's returned well over 1,500% gains. AND IT’S NEVER HAD A DOWN YEAR DURING THIS TIME. Look, I can't tell you exactly how bad things are going to get as our debts continue to soar, interest rates rise, and the value of our money continues to fall. No one can. But I can tell you with 100% certainty that the next crisis is going to be very different from what we experienced in 2007-2008. I think some of Donald Trump’s ideas are fantastic. Cutting taxes on individuals and corporations is the best thing you can do to spur the economy. But it appears he is going to also ratchet up deficit spending, which can only make our situation worse. The only question is: Will you take the necessary steps for the big shift coming to America? And that's why I want to send you a copy at a huge discount. The $19 fee basically just covers my costs to produce, print, and ship this book to your home. As I’ve said: The fewer people who have to rely on the government for help, the better off we'll all be. When I send you your copy of America 2020—The New Crisis, there are three other Research Reports I've been working on that I want to give you immediate access to as well, all totally free of charge. 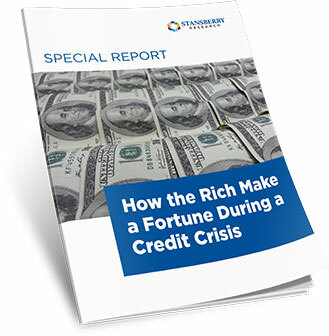 How the Rich Make a Fortune During a Credit Crisis. 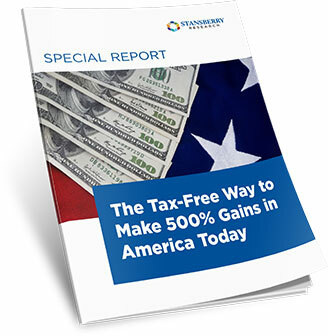 In this report, I want to show you a strategy used by some of the wealthiest people in America. David Tepper, for example, used it after the market crash of 2008—his entire portfolio went up 120% (after fees) that year. This has nothing to do with shorting or trading options or anything risky like that. As inflation builds, this strategy could be a life-saver. It’s a way for you to get money OUT of the financial markets, into something real… and potentially sell for several times your initial investment, while keeping most or even all of the gains, totally tax-free. 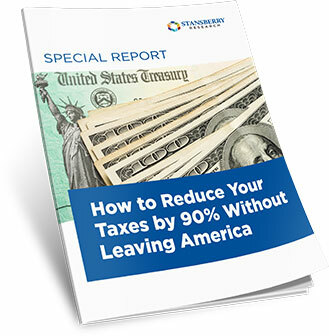 How to Reduce Your Taxes by 90%, Without Leaving America. Broke governments do truly desperate things. And while Trump is reducing taxes over the next few years, in a crisis, rates could soar. You should at least know about a radical strategy, which several of my colleagues have taken advantage of. It requires a few major changes, but is the only way I know of to legally reduce your taxes by 90%. In my monthly research report, I will regularly update you on the continued collapse of our currency and rising interest rates—I’ll tell exactly what these things mean for you and your money. My Investment Advisory Service, which you'll receive on the first Friday of every month, is the perfect way to stay up-to-date on what’s taking place in America right now. You'll pay just $19 to get all this Research delivered to your doorstep. If you like our work, great -- I hope you'll want to keep reading our research and insights in the future. We'll bill your card a fully-refundable 1-year subscription fee of $149 after your 30-day free trial is over. I think you'll benefit substantially from receiving our work over the next few years... but like I said, if it's not for you, no problem. By paying just $19 today, you'll at least have the information you need to protect yourself from the disaster taking place. 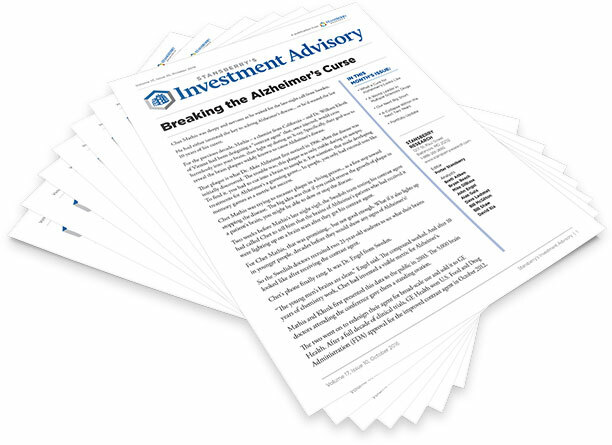 Plus, you'll receive access to a bundle of bonus Research Reports and a free thirty-day trial subscription to my monthly research letter, Stansberry's Investment Advisory. And you are under no obligation whatsoever to buy anything else from me or my firm in the future. I know, most people reading this will do nothing. They'll say to themselves: "I'll deal with this problem when the time comes." We’ve lived with rising bond prices, falling interest rates, and a world dominated by the U.S. dollar for more than 30 years. This point is: Take the simple and critical steps now, while it's all safe, cheap, easy, and 100% legal. Don't wait. We’ve entered a major turning point in U.S. history… and it’s critical to position yourself accordingly. 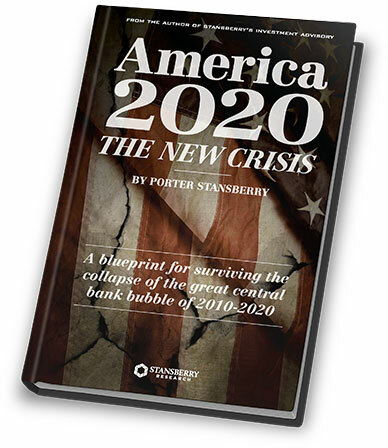 You can learn everything you need to know simply by requesting a copy of my America 2020—The New Crisis. Remember: You'll pay just $19 today. You'll receive an electronic copy of this book—and all the other research I’ve described—instantly, then a printed copy of the book will arrive in the mail, soon after. This book is brand-new… it’s being printed right now… and you’ll be among the first to receive it. There's virtually no risk to you giving my work a look, either. If you don't benefit from my America 2020—The New Crisis book, just give us a call in the next 30 days, and you can receive a full refund. Or... simply let me know any time within 30 days AFTER your card has been charged for a subscription, and again... you'll get a refund for the entire subscription fee. The point is, I'm only suggesting you TRY my work to see if you like it. If not, simply call our customer service team and we'll issue you a full refund for your subscription charge. This takes you to a secure Order Form page, where you can review all the specifics of this deal once more, and enter the details on where you'd like your copy of America 2020—The New Crisis shipped. 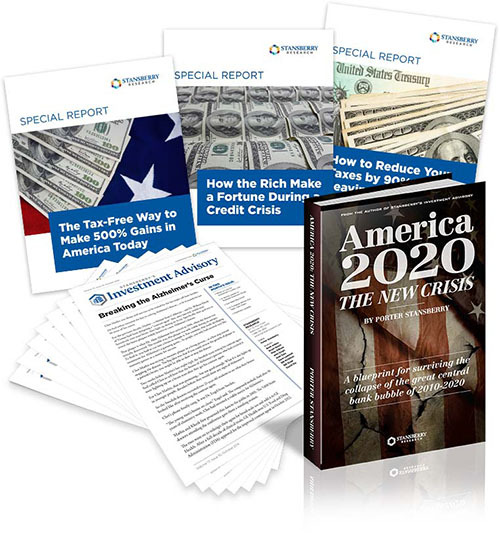 You'll receive electronic copies of America 2020—The New Crisis, the three (3) extra Research Reports I described, and access to my Investment Advisory in a matter of minutes -- immediately after placing your order. A printed version of America 2020—The New Crisis will arrive on your doorstep, soon after.